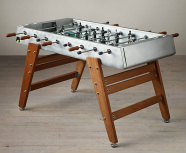 Foosball is known as an indoor game since tables are typically manufactured with parts that don't fare well in the elements. If you leave your traditional game table outside you will notice the rods tend to rust and the wooden cabinet and playing surface will first warp before eventually rotting out. However, some manufacturers have solved this problem by producing tables that are specifically designed to withstand the outdoors. These weatherproof models have anti-rust materials and wood or plastics that are protected to resist warping, making them the perfect versions for parks, backyards, resorts, vacation and beach homes, frat houses, outdoor bars, tailgates, and more. Just be prepared to spend a little bit more on these models because they have upgraded components from the top down. These are dual purpose and you can use these inside or out. Having a table designed to be outdoors doesn't always mean you can just leave it in your back yard for years and it will stay in good shape. Make your table even more weatherproof by covering it up when you aren't using it and during rainy or snow seasons. Protect your investment with a heavy duty cover that is intended to keep the rain, snow and sun damage off your table.